Driveby Andy: You have five dollars, Quit Your Job! This five dollar bill came through work today. A customer paid with it. I wonder what the person that did it meant. 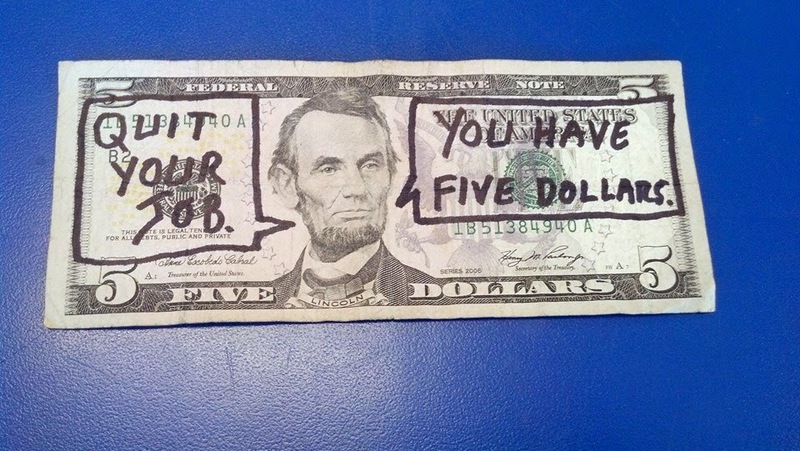 I like to think that they meant that hey, you've got five dollars. That's enough for an adventure. So quit your job and go experience life. Ironically, I did quit my job this week. At least, I put in my two and a half week notice. As previously mentioned I have no concrete plans. I'm still a little nervous about it, but not really. The way things have gone since I put in my notice have really shown me that I made the right decision. Number one priority after my last day at work is to finish cleaning up my life. Clean out the rest of my storage unit, get rid of junk vehicles, my old travel trailer. Everything must go, pretty much. After that the motorhome should be ready to roll and I will have a clear calendar and clear mind to pursue not only adventures, but I'm definitely ready to make self-employment a reality again. Just like it used to be. The clear mind and space issue is huge for me on that front. I will be able to focus on becoming financially independent again, with no distractions. Unrelated note, the new engine is in the motorhome. The transmission is back in place also. I have a lot of things left to do before I can start it up, but things are looking very good. Maybe with a tad bit of luck, I'll be able to start it up on Monday? Still in no hurry, as I want to make sure I did everything right.